Ciaran Dowd: Don Rodolfo tickets are now available. This silly swordsman is the perfect answer to the holiday blues. Don Rodolfo is a complete tool, an unapologetic rake, a shameless narcissist and the greatest swordsman of all time. Part Don Juan, part Don Quixote sit back and let Don Rodolfo tell you a tale or two of his adventures, his dalliances and other ridiculous happenings. Ciarán is a character comedian seen on Drunk History, Josh and Game Face. He’s a member of the much-lauded sketch group BEASTS. He makes his solo debut with Don Rodolfo. 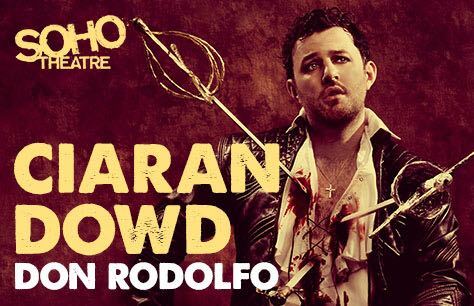 Tickets for Ciaran Dowd: Don Rodolfo at the SOHO Theatre Upstairs are available now. Book your tickets sharpish to ensure the best seats at the best prices to this laugh out loud show.